The post-Takeover champions intro airs to start things off while Tom Phillips hypes up the Era of Strong Style. Nakamura faces Steve Cutler tonight, but TM61 start the show against Tony Nese and Ariya Daivari. The crowd goes crazy for the Cruiserweight Classic team, while TM61 still come off like two generic dudes. Nese shines more than TM61 has in mere seconds with flips and superkicks. His Fosbury flop takes out both guys on the floor. Nese and Miller have an impressive slap and kick exchange leading to a Nese and Daivari hitting a powerslam, superkick, and frog splash for two. But Thunder Valley wins the match for TM61. Asuka says she respects Bayley, and that while Bayley fought hard, she fought harder. Asuka says she's cleaned out of the division, and no one is ready for her. We get a bit of hype for Austin Aries vs. Andrade Almas, and Ember Moon stands around in the grass at Full Sail University to prepare for her match tonight. Cutler says that tonight, he will show what sacrifice means. He gave up four years of his life to get this chance, and he doesn't care if anyone likes him or hates him --everyone will respect him. Leah Von comes out to face Ember Moon. Moon's body movements are amazing -- like Nakamura, she has complete control over every part of her body and it makes her intro stand out. Moon outwrestles Von with a series of armbars and a headlock before getting two off of a springboard crossbody. Moon gets another near fall off a schoolgirl before hitting a hammerlock suplex and winning with the diving corkscrew stunner, which is as beautiful as Cena's springboard stunner was ugly. No Way Jose goes off on Bobby Roode disrespecting him and cuts a pretty intense promo tying "No Way" into how he feels about backing down. This character needed a serious edge, and they've given him a bit of one here. A Revival hype video airs before Tommaso Ciampa meets with a trainer. Johnny Gargano says that his knee will be okay, and that if they get cleared, they can be in a tag match at the CWC live finale next week. The trainer clears him -- so they're a go for the CWC show. Almas comes out to face Aries. Aries outwrestles him to start, but Almas comes back with a running rana that sends Aries to the floor. Aries tries to toss him out, but Almas does his waiting pose and sends Aries out of the ring before hitting a corkscrew plancha. Almas goes up top, but Aries tosses him to the floor. A dueling chant breaks out before Aries rakes his boots on Almas' face and an elbow gets a near fall. Almas hits a springboard dropkick, but he takes too long for the shotgun knees and eats a corner dropkick. Almas' double-backflip moonsault hits for two. Aries gets hip tossed into the buckle, but he avoids the shotgun knees, powerbombs out of a springboard rana, and wins with the Last Chancery. A video for Sanity airs and Roode vs. No Way Jose is announced for next week. Samoa Joe joins Phillips and Corey Graves on commentary, with Joe continuing Raw's gag of getting Phillips' name wrong. Cutler comes out to a generic song while Nakamura's usual intro gets the crowd alive. 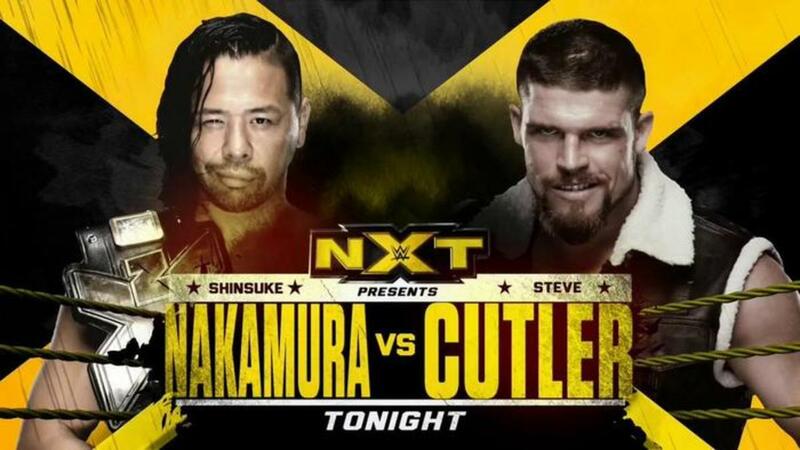 Nakamura and Cutler have a fairly short five-minute match that shows off Nakamura's key spots, while Cutler gets a few shots in and shows a lot of aggression. The inverted exploder, corner knee, and Kinshasa win it for Nakamura. Nakamura poses and Joe fumes at the table as the show goes off the air. Solid show, but nothing too amazing.